After I finished my latest comic, Wandering Koala uncovers the Sixth Figure, an exciting murder mystery, I wanted to do something really different. the Sixth Figure was very stylized in a comic book format. It is visually exciting and a great deal of fun to do, but it's not what I enjoy doing most. 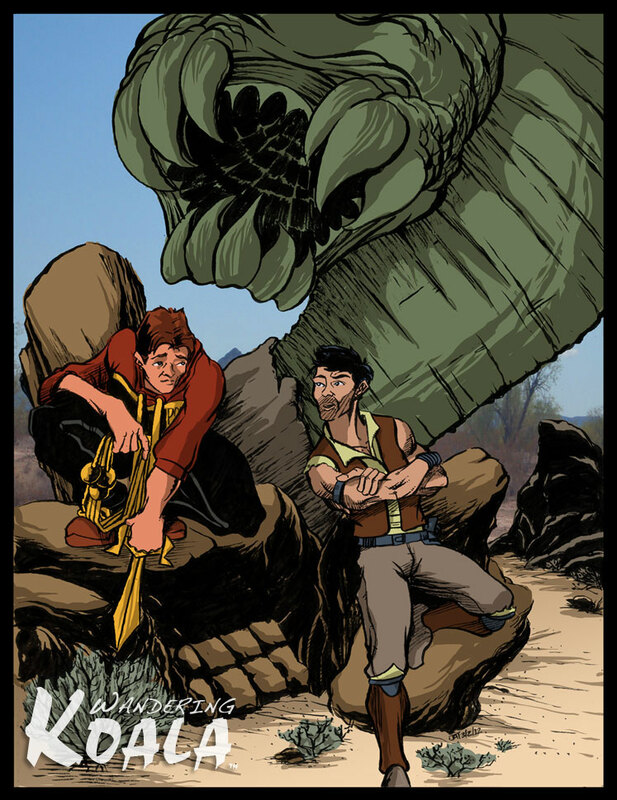 My very favorite art work to do is a one-page, full color illustration that tells a story. I've also wanted to do a team up with Wandering Koala and another character for a while. But who to choose? Jak Phoenix, of course! Jak Phoenix is an exciting space opera created by Matt D. Williams in his debut science fiction novel. The sequel, The Markazian Deception, is due this spring. I really enjoyed the first novel, and am looking forward to the second which made me wonder what would happen if the Wandering Koala somehow made it into space and met up with this indifferent adventurer. I usually keep my character in this world with situations that could and do happen in everyday life except for one fantastic element. But I also made sure to give Kyle several magical tools so his world was open to anything. So it is possible for the two to meet. I laid out the illustration with a Staedtler 2B pencil, penciled it with a Sharpwriter mechanical pencil, inked it with a paint brush and sumi ink, then colored it in Adobe Photoshop CS. I was really pleased with the result. Plan on seeing more one-page illustrations, both black & white and color. I'm currently writing a science fiction short story, but after than it's another illustrated novella like The Caveman Conspiracy! Let me know what you think of this latest illustration. I'm an artist, writer, and designer who builds unique Websites, programs custom Web Applications, and creates original character designs and illustrations. Nancy Hansen asks IS THERE LIFE OUTSIDE PULP? in her latest column!